The baby chickadees have fledged. I suddenly realized I should probably clean out the nest box. This is my first experience hosting a bird nest! I watched the Black-Capped Chickadees build their nest in my birdhouse. I watched as the adults flew to the box with something in their mouths. I assumed they were nest building. I left mounds of cat fur for them and apparently, they used it. Weeks went by, as I watched the adults flying to and fro. After a while, I realized I hadn’t seen any activity coming and going from the birdhouse and wondered whether I had missed the young fledge. I watched and listened in my yard for baby birds. Sure enough, I began to hear what sounded like baby chickadees begging. It’s not hard to distinguish the sounds of the young from adults. They were still close to home! It was then that I wondered whether the pair would have a second clutch. I did a little research and learned that it was possible, but not certain, and that if they were to start another nest, it could be pretty soon. So I decided to clean out the birdhouse. I was eager to see the nest. I carefully removed the back door and peered inside. It was not what I was expecting. For some reason, I was expecting to find the standard round nest, a perfect circle. 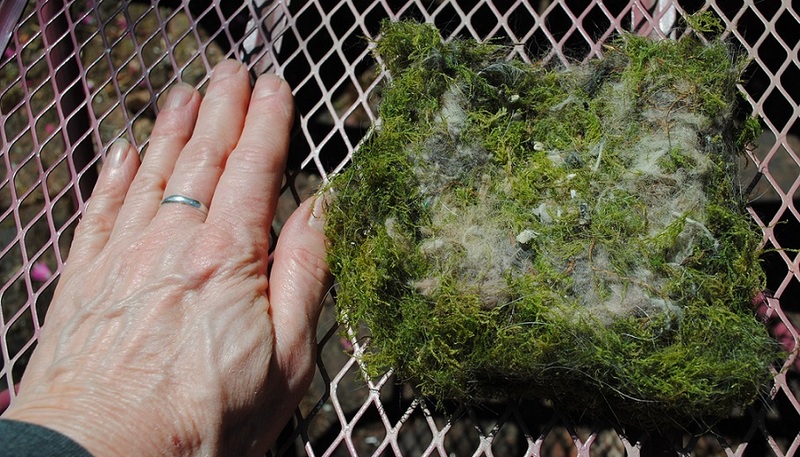 But instead, there was a thick bed of moss, lined with bits of fluff and fur. This is typical chickadee nest material. What a plush, comforting, supportive bed for eggs and chicks! I lifted the nest out and took some photos.